As technology quickly evolves causing the global marketplace to demand dynamic, innovative and cost-effective solutions, the need for qualified project managers who are able to meet ever-increasing performance expectations continues to grow. According to PMI.org, 15.7 million new project management roles will be created globally by the end of the decade in 2020 in some of the most project intensive industries including IT, finance, construction, architecture, and healthcare. The profession is expected to grow by US $6.61 trillion worldwide. Now is the time for professionals to enhance their project management skills, as demand for these skills outstrips supply and for employers to ramp up their recruiting efforts to attract qualified candidates away from the competition. Project Management has been declared as one of the most valued skills to have in 2017 in recent studies and was also identified as one of the top 10 hot skills in IT in a recent survey done by Computerworld. However, what do these statistics mean for individuals seeking a new opportunities or managers looking to hire? That’s where the perspective of an experienced recruitment professional can make a difference. Why the demand for project managers? So what’s the deal, why are project managers so in-demand right now and why is the demand continuing to outgrow the supply of talent? This isn’t a new trend, project managers have been in high demand since 2010 as nearly 80% of high performing projects are led by certified project managers (PricewaterhouseCoopers). For this reason, the PMP credential is extremely important to most organizations, as is prior work experience with managing high caliber projects. As mentioned, budget constraints and the pressure to deliver products and services quicker to please various project stakeholders has also been driving the demand upward and now Agile’ PM has spread across all industries and merged with the classical project management methodology. The trend of adopting Agile PM methods has come hand-in-hand with the adoption of PM software solutions and applications that digitize and automate processes and benefit data analysis. This has increased the manageability of both complex and large-scale projects, as well as projects with extremely short, fast, life-cycles, particularly in innovation-driven industries. As the innovation-driven industries are expected to grow exponentially, we can also expect the demand for specialized project managers to continue to increase. High demand = high salaries. Project managers earn more than the U.S. population with an equivalent educational attainment, hence why work experience is an essential factor in this field of work. Leading project managers have not only put in years of work but also the effort to prepare for and pass the PMP exam to earn and maintain their credentials. As these skills are so high in demand, it comes to no surprise that salaries are soaring particularly in the IT space. According to PMI.org, the high demand for project-oriented professionals is reflected in both average salary and salary growth. PMP credential holders in the U.S. earned an average of 16% more (approximately US $14,500) than their non-credentialed peers in 2011. 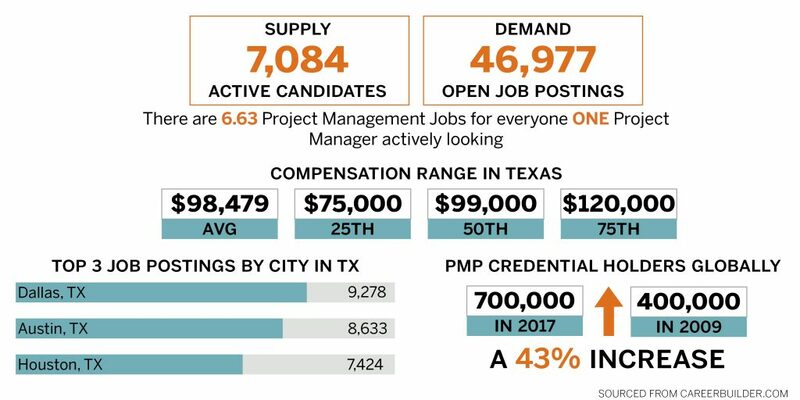 Additionally, between 2004 and 2010, high demand for project-oriented professionals drove the faster-than-average salary growth of a PMP; salary growth among PMP’s averaged about US $2,800 a year, while that of non-project-oriented professions was approximately US $1,700. If you are looking to compete in the IT hiring space, especially for project managers with specialties in certain areas like Agile/Scrum or Lean project management, it’s essential to offer highly competitive compensation packages in order to attract top candidates with prior experience and PMP credentials. If your organization works on large-scale projects investing in quality project managers is worth it for the success and growth of your company. Not to mention projects with large budgets are a big draw for top talent! Finding talent and then determining if that talent has the technical skills and experience needed to thrive in the position is no easy act, as we have discussed before here (link). In addition to excellent communication and leadership skills, IT project managers should also understand the tools and methodologies of the relevant technologies and learn about trends affecting these technologies. In order to problem-solve with the project team, the manager needs to first comprehend what they are doing. Typically when looking for a good fit for an IT project manager position, you should focus on candidates that have experience using software your company regularly works with such as Microsoft Project Server, Microsoft Project, JIRA, SmartSheet and more. Additionally, projects with larger budgets have more moving parts, more risk and greater scrutiny from management, so it’s important to find a project manager that has the ability to formulate and define the technical approach of the project, in conjunction with other IT resources while identifying and scheduling project deliverables, milestones and required tasks of the technology solution. Knowledge of formal agile software development methodologies is also a plus! In conclusion, if you are looking to compete in the hiring space for project managers, you’re going to have to pay competitively and find creative ways to differentiate your company from the hundreds of other companies that are competing for the same talent. Also, you can contact Agile Premier and have an entire team of specialized technical recruiters tackle your search simultaneously.